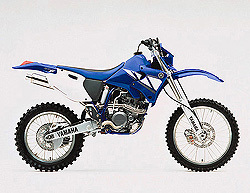 A non-commerical reference page for the Yamaha WR250F 4-stroke off-road motorcycle. A service of MicaPeak.com. Starting procedure Here is the official Yamaha starting procedure, from the update bulletin sent to the dealers. It contains a more elaborate description of the proper procedure than you'll find in the owner's (shop) manual. modification Stock, the US models have a throttle stop screw which prevents the throttle from opening more than about 3/4 of the way. This modification allows the bike to rev freely, and yields a bunch of "free" horsepower. WR250F Registry There is a Registry here at micapeak.com for a number of motorcycle models, including the WR250F. It provides information about the owners and their bikes, including useful stuff like how experienced the owner is, what tires they use, what problems they've had, modifications they've made, etc. Comparison to DRZ400 Here are some comparative photos of the 2001 model WR250F and the Suzuki DRZ400E. They show the higher quality fit and finish of the Yamaha. The photos were taken by an Olympus C3030Z digital camera at Seattle's Cycle World show. Oil change warning If you follow the procedure in the owner's manual for changing the oil, you must remove the frame (oil tank) drain bolt directly behind the front wheel. The manual doesn't tell you this, but when you remove it, the hot oil will shoot straight out and drench your front tire. Have a piece of cardboard ready to use to deflect the oil stream downward as soon as you remove the drain bolt. Motorcycle Daily did a favorable review of the WR250F: Part 1, and Part 2. 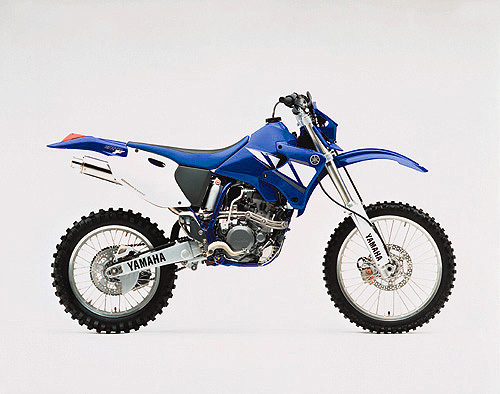 Here is the official Yamaha WR250F page. Accessories are available from Stroker.